Many look at insomnia and think it’s a symptom of something else, such as stress, bad diet, lack of exercise, or even a disease. But, that may not be true at all. Researchers in Japan are looking at insomnia from a different angle — that insomnia is the cause of those problems. Using previous research that shows that insomnia causes a decrease in blood flow in the front dorsal lobe of the brain, and correlates it with depression, the authors of a new study seeks to establish a link between insomnia and depression. Depression is a hidden killer. It is a condition that affects people all around the world. Suicide is the second leading cause of death in the US among people aged 15 to 34. Middle-aged males, one of the groups that was found to suffer the highest rates of insomnia are also the likeliest to commit suicide. In March of 2011, over 7000 hospital staffs were given a self-administered anonymous questionnaire. The questions included information about the respondent’s gender, age, and medical profession, as well as questions about their sleeping history two weeks prior to responding to the survey, as well as detailing their overtime work, and their history of disease and chronic pain. It also asked them to assess their own feelings of depression and fatigue. 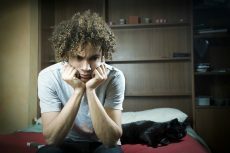 Chronic insomnia can lead to depression, and a better understanding of the link between the two conditions could be used to improve treatment, and prevent the condition from worsening while strengthening the world economy. The hope is a survey will be developed for healthcare professionals (and other high-stress professions) that can identify insomnia before it becomes a problem.